The biggest event in the southern area of Shan takes place at Phaung Daw Oo Pagoda that situated in Inle Lake, one of the most amazing and magical places in Asia. 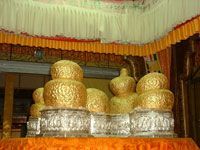 It is held from the first day of the waxing moon to the third day after the full moon of Thadingyut. It takes about 18 days. This festival is held with great magnificence and pageantry. The Phaungdaw Oo Pagoda is one of the famous principal shrine in Myanmar, this pagoda houses five small Buddha images which are much revered by lake dwellers. During the 18 days of the festival, a ceremonial Karaweik- a replica of the ancient Royal Barge displays and carries four of the Buddha Images which are much revered around the lake, from village to village, to bless of leg-rowers and hundreds of boats follow the procession. The smallest of the five figures stays at Phaung Daw Oo Pagoda to act as 'guardian' of the temple, following on ancient that happened many years ago when the procession used to carry all five images around the lake. Among the dance shows and fan-fairs, the most interesting event of the festival, especially for foreigners is Shan traditional boat races due to their unique leg rowing. It is the one and only place in the world that one can see such marvelous act. This year Phaung Daw Oo Pagoda Festival will begin on 12th October and end on 29th October. 18th and 22nd October is special recommend for taking photographs. Thousand of people from all villages nearby and the Pilgrims of the whole country come to pay homage to the Images and enjoy this most holy of Shan celebrations. Welcome on arrival Yangon, meet and transfer to hotel. Start sightseeing to Shwedagon Pagoda – over 2500 years old and one of the world's most spectacular religious monuments, Sule Pagoda – over 2000 years old surrounding the old colonial style building in the city centre, Bothathaung Pagoda. Stay overnight at the hotel in Yangon. After breakfast at the hotel, transfer to airport to Heho by domestic flight. Drive to Pindaya to visit Pindaya caves unique for the thousands of Buddha Images placed by there pilgrims over many centuries, drive back to Nyaung Shwe. 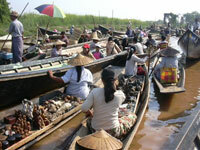 Transfer to Nyaung Shwe jetty and boat trip to Inle lake. Overnight at the hotel in Inle. After breakfast, visit to Lin Kin for sightseeing of Phaungdawoo Pagoda's annual Processional Festival. 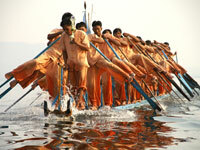 Enjoy traditional leg-rowing boat races with music and dance show. Visit to the weaving village of Inpawkhon and Ngaphekyaung Monastery - popular for its jumping cats and numerous collections of Buddha images and alters. Overnight at the hotel in Inle Lake . 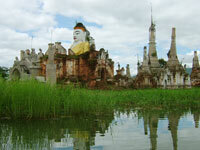 Visit to Nyaung Shwe to pay homage to the revered Buddha Images and enjoy more of traditional leg-rowing boat racing. Overnight in Inle. After breakfast, transfer to Nyaung Shwe by boat. Drive to Taunggyi. Visit to Taunggyi Market, Continue to Kakku - very impressive with it's beautiful 2548 pagodas believed to have been built since 307 BC and two old bronze ringing bells. Continue drive to Heho Airport . Flight back to Yangon . Overnight at hotel in Yangon. After breakfast, visit to Scott Market – gems arts & crafts souvenir stores, Chaukhtatkyi – a large Reclining Buddha Image, Kabaraye Pagoda that means World Peace Pagoda. 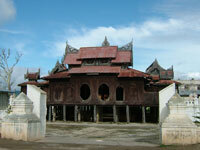 Then, transfer to Yangon airport for departure. THIS YEAR IT WILL BE STARTED ON SEPTEMBER,28 AND ENDED ON OCTOBER 15. 04.10.11 at 10:00 AM - Arrival in Nyaung Shwe with boat race.